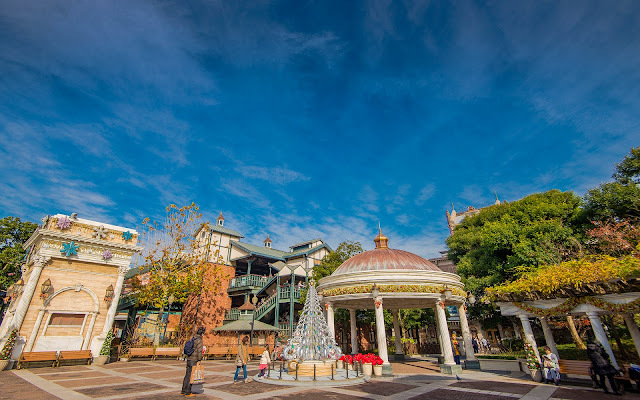 Tokyo Disney Sea is such an immersive space that even a plaza with no overt connection to a store, restaurant, or attraction can be incredibly atmospheric. The scene below, for example, is just ambiance. It's an open space where guests can gather and just congregate or rest, similar to a square or park in a real city, and it's just a pleasant area to stop and take in the environment. During the holidays, the area takes on a more festive feel, giving some holiday cheer to this ode to a U.S. city by the sea! Christmas is fanciful in the American Waterfront plaza just beyond the Hotel Hightower.